What specs Matter in a DSLR? Rather which parameters make one DSLR better than the other DSLR? Not to forget, these determine the pricing. The medium format digital cameras manufactured by Swiss company Hasselblad is almost the standard for mission critical situations. Why from NASA to ISRO all selects Hasselblad or other brands over the mainstream brands like Canon or Nikon? Why once king in film, Kodak is not seriously in the DSLR industry? Before we go deeper in to this topic, we must understand the biggest difference between a traditional Film SLR Camera and a DSLR Camera – a DSLR is a System on Chip (SoC) driven mechanical instrument. Whereas, in case of traditional SLRs, the mechanical parts were only the deciding factors, thats when we are not taking the optical part in to consideration. Usually if one of these core component dies out of some reason, it is unlikely to get back again normally working after a repair. It is the practical fate of any consumer grade device – price of repairing is higher, lower is the satisfaction rate. Chipset – that is kind of motherboard of your laptop, is often unknown due to close source model of business. 1D Mark II had a main CPU of 32 MHz , 32-bit RISC processor and extra AF tasks were driven by 33 MHz, 32-bit RISC CPU. There are users who over clocks! As there is no fan, it can kill the device. Usually the mainstream manufactures do not have budget (pun intended ) to allocate a volatile dedicated memory allocation system, most are not capable to shoot without a card. Usually 512MB x 2 DDR3 SD RAM drive the full frame cameras. Storage I/O should be of highest priority – how fast it can write matters, mostly the bottleneck becomes the chipset, processor and RAM. These points explain why high cost Hasselblad cameras are used by space projects. Depending on the need, there can be custom spec DSLRs. We talked about Image Processor and Image Processing Engine before. As like nowadays “standard”, tapes, glues keep the cables in position. Unfortunately, these specs are usually never mentioned by the camera manufacturers. All photos are taken by iFixit. So, to decrease the “load” on your camera’s weak processor, you should use image RAW mode! It is better to avoid much load on the processor, you should process them on your MacBook Pro or Linux PC later as a part of post processing. On the practical part, as all are closed sourced; the answer to the question – What Specs Matter in a DSLR is quite blur. Unless some one file consumer case against the manufacturer to know what is inside, it is far from the truth to know what is really inside. This Article Has Been Shared 4443 Times! 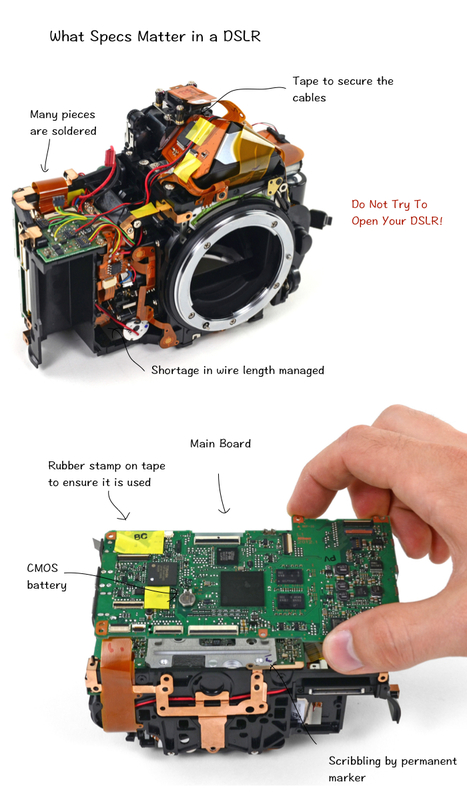 Cite this article as: Abhishek Ghosh, "What Specs Matter in a DSLR," in The Customize Windows, August 24, 2014, April 21, 2019, https://thecustomizewindows.com/2014/08/specs-matter-dslr/.